I live in the city. I DO live within one mile of the city limits on the very opposite side of town from where I used to live (within one mile of the city limits). 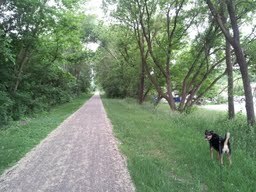 Approximately one city block from my house is a trail that used to be (when I was a youngin') part of a railroad system. Even when I was a kid, the tracks were no longer in use (it was sooooo frustrating riding the bus to school and HAVING to waste time stopping at those tracks when everyone knew a damn-train wasn't coming!). I don't know how far east the trail actually travels. I know that to the west of my house it becomes Falling Waters Trail.The Falling Waters Trail is 10.41 miles and ends in Concord. I love having my city amenities and living so close to this trail. 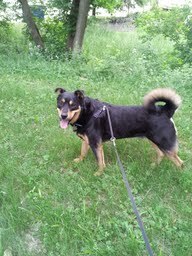 And Buddy, of course, love all the scents on his walks down the trail. Buddy is eager and ready to continue. 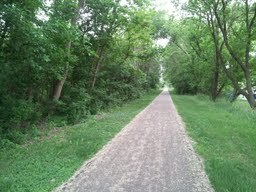 The apex of this picture is about one block of the trail. 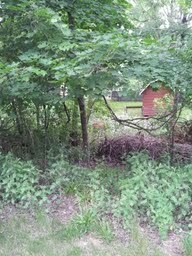 It's hard to see in this picture, but a common occurrence in the woods along the trail is the spotting of deer. If you look real close, you can spot the brown of it in the center of the pic.